How was your weekend?? Are you getting excited to start a new week? Just think of all the cool things that can be done! As well as the not so cool things like the big laundry pile, but hey.... it always feels good to accomplish something, even if it's one of the essentials. I have to share with you a picture that one of my readers sent to me. 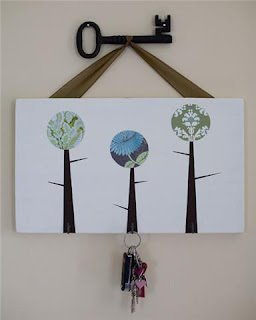 Lindsay took an idea for an easy art project that I shared a while ago and made it super-de-dooper cute by adding hooks and hung it with ribbon from an old key. Don't you love it? How cool Lindsay. Thanks for sending me a pic. You can find more of her cute stuff HERE. My project today is going to be a bit low-key because I'm hoping to get to do some fun summer activities with the fam, but I wanted to squeeze some creativity into the day. I found this really large bread board from DownEast Outfitters the other day on the way back from a race at Bear Lake. I'm planning on restyling a few chairs this week, so I thought I'd make a sign that you could hang next to chairs. I added some vinyl lettering with a quote that I saw one day on a decoration that was hung in Kneaders. Click HERE for pricing. Have a wonderful Monday! Remember that I have changed Creative Cat's to be once every few weeks instead of every Tuesday. I'm trying to be a little more balanced! The next CC will be on June 30th! Thanks to everyone who linked up last week! We had so many fun projects!! love the use of the bread board!